Do you find yourself waiting to the last second to do things? Do you often rush in order to meet a deadline? If the answer is yes to either or both these question then you are not alone. 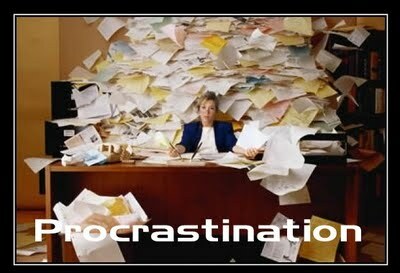 We all are familiar with procrastination. It is a vicious habit that prevents us from being truly successful in life. Here are 7 tips that will help you to stop procrastinating and take control of your life. 1.Make a To Do List. Creating a To Do list will help you outline the things you need to get done. The most pressing or hardest matters should be at the top, so that they are done first. It is importantly stick to the list. This is easier said then done, but you will be surprised how much you will get done if you don't stray from the task at hand. Only check emails once every hour instead of every five minutes. Put your phone on silent and turn off the TV, in order to avoid temptation. 3.Break your work into mini steps. Procrastination is often the product of feeling overwhelmed. If you break your work into micro steps, then you be more likely to get it done. Also, set deadlines for those steps. Creating a time line for the steps will decrease the likely hood procrastination, because to do so would shift you entire time line. Look at your work space. Does it make you want to be productive or snuggle up and sleep? If the answer is snuggle up and sleep, then a change is in order. 5.Hang out with people who inspire you to take action. The people we are with influence our behaviors. If you were able to talk with someone from Forbes top 100, you would probably be inspired to work. Since that is not likely to happen, surround yourself with go getters and hard workers, because the same principle applies. Also, get a buddy who will push you to complete your goals. There is never a right time to do things. If you keep pushing back your work, because X, Y, and Z happened then you will never get anything accomplished. In the end it does not matter how much planning, organizing, or timeliness you did. What will matter is taking the first step and putting your plans into action. You can't procrastinate your way to success.